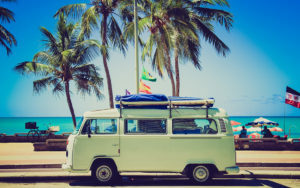 The summer travel season kicks off officially over Memorial Weekend and our team at Desert Car Care McQueen has many tips for motorists. Whether you are traveling to the Phoenix Sky Harbor Airport and onward via plane, or planning a weekend camping trip in the high country of Arizona, getting there on time and safely are the key ingredients for a perfect summer holiday. First, allow plenty of time for potential delays such as accidents, traffic jams or road construction. While GPS systems make traveling easier on many levels, they don’t eliminate the need for checking on such things as road and weather conditions as you plan your trip. There are a multitude of mobile applications that can track and alert you to issues that you may unexpectedly encounter on your chosen route, such as unusual traffic or detours. Even if you rarely need them in day-to-day travels, these tools can come in handy for longer journeys. However, there also will be many locations where your mobile or satellite signal may disappear. We advise having printed directions and papers stashed in the glove compartment just in case you become lost and have no signal to help you get back on track. Tires for tread and inflation levels. Also, make sure your spare tire is in good condition and that you have the tools you need to change a tire, such as your jack and a wrench for removing lug nuts. Battery – Make sure it’s securely seated, and connectors are clear of corrosion. First Aid Kit – Every vehicle should have one. Include typical first aid supplies like disinfectant, bandages, scissors, rubber gloves, and specific items such as moleskin if you plan to do a lot of walking or hiking during your trip. Check oil and fluid levels, and top off any that are low, including windshield wiper fluid. Also, make sure the wipers are in good condition. Plenty of water and something that can be used for shade. In Arizona, these should be considered essential items that are always in your vehicle, particularly from May through September. Be prepared to join hundreds of others taking advantage of the long Memorial Day weekend that kicks off summer travel. The AAA expects 39.3 million Americans to travel 50 miles or more away from home. That’s one million more travelers than last year, and the highest Memorial Day travel volume since 2005. Multiple sources also suggest getting a good night’s rest before traveling, leaving during off-peak driving times, and ensuring drivers are focused on the task hand.